Norman Lake's cure for the common cold. Otherwise known as the "IND". the temperature in the nose normally is around 91 degrees, making it an ideal breeding ground for the rhinoviruses, he said. 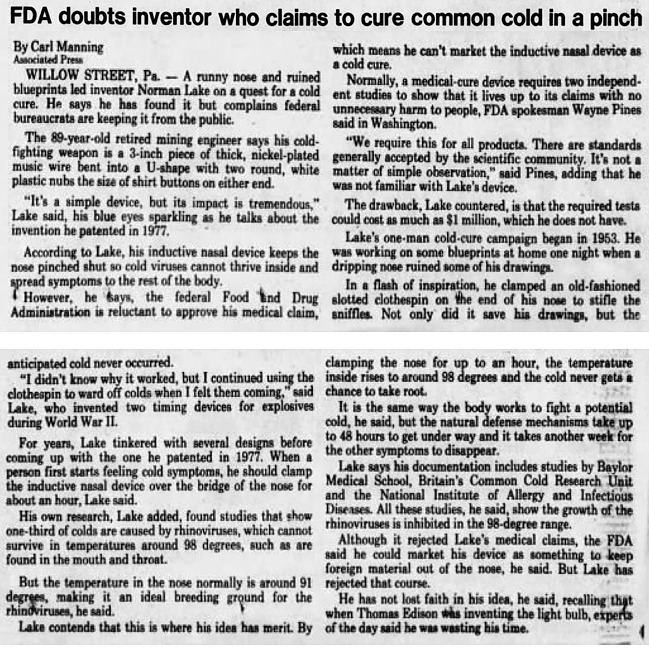 Lake contends that this is where his idea has merit. By clamping the nose for up to an hour, the temperature inside rises to around 98 degrees and the cold never gets a chance to take root. "I definitely believe that the worms had a hand in that painting,” he said, adding later: “When you kind of look into the nitty-gritty of how much of the human body actually contains your DNA versus the billions of different bacteria that live within us, you start realizing that you’re an ecology of beings that live within us. 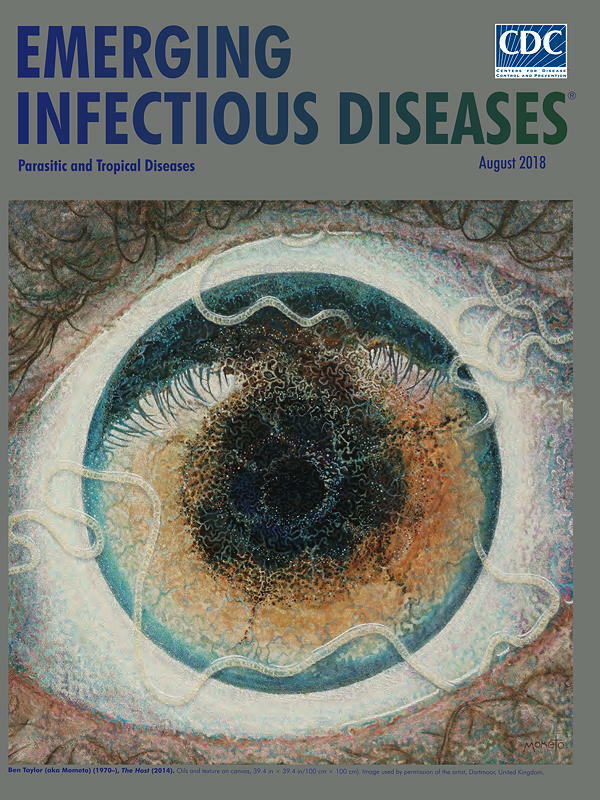 He later adapted his painting to make it more obviously an eye infected by parasitic worms, and as a result it’s been chosen as the cover art for this month’s issue of Emerging Infectious Diseases. They're called SEETROËN glasses. They were designed by the French car company Citroën, which claims that they're the first glasses that eliminate motion sickness. Apparently the blue liquid in the glasses simulates level ground, which helps stop the vertigo feeling that some people get while traveling. 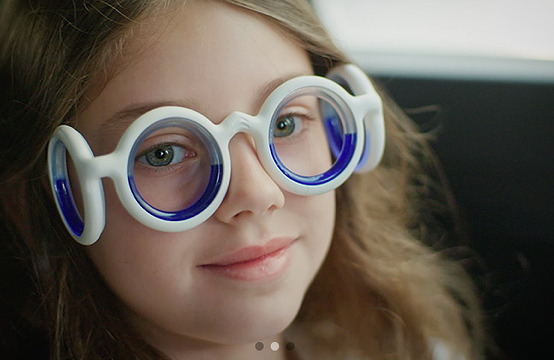 Interesting concept, but they look a lot like "crazy straw" glasses. 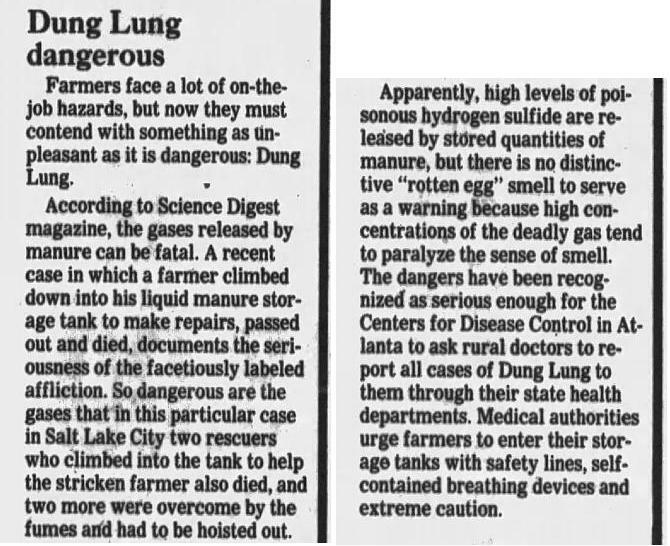 Death by breathing in dung fumes. It doesn't sound like a pleasant way to go, though perhaps not the worst since apparently before it kills you it paralyzes your sense of smell. 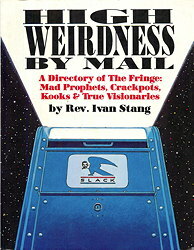 But it's definitely a weird way to die. 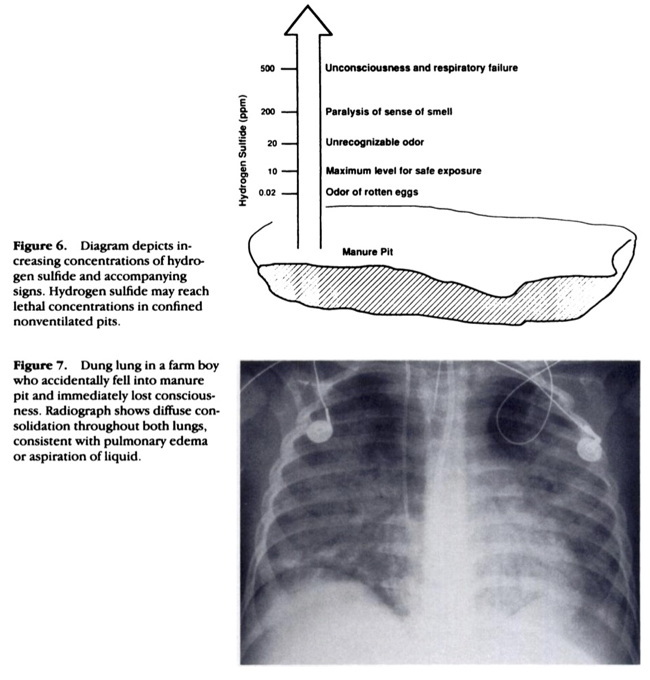 “Agricultural Disorders of the Lung,” RadioGraphics (1991); 11:625-634. 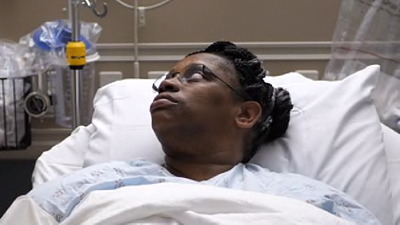 In the news recently, Kendra Jackson who had long been suffering from chronic sneezing and a runny nose, was diagnosed as actually having a brain fluid leak — after doctors had been telling her for years that she just suffered from allergies. A surgical procedure managed to fix the problem. 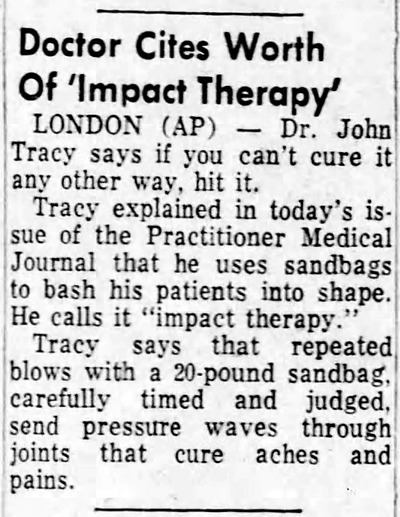 Reminded me of the 1936 case of "sneeze girl" that I posted about 2 weeks ago. Perhaps Sneeze Girl was also suffering from some kind of brain fluid leak. 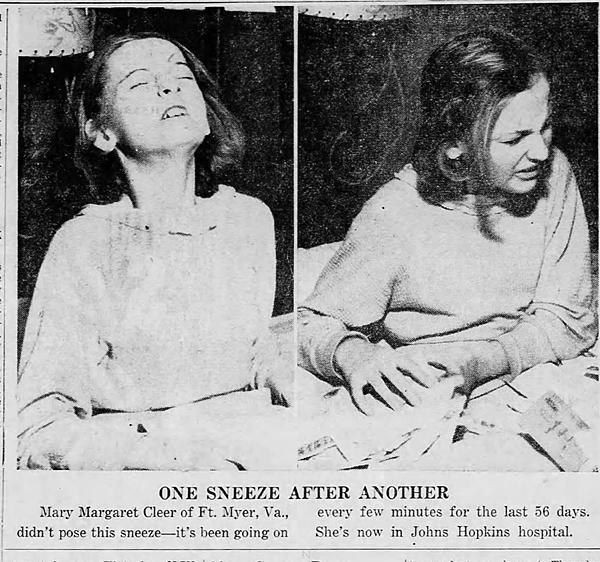 Because she had been sneezing every few minutes since Oct. 9, Mary Margaret Cleer, 13, daughter of a Fort Myer, Va. gasoline station attendant, last week held the attention of a great many curious laymen and puzzled doctors. No one knew what caused the prolonged sneezing fit which had racked the child to skin & bones and put a constant, haggard sneer on her face. To see if allergy to some substance caused the sneezing, Washington doctors scratched her skin some 80 times, rubbed into the scratches hay pollen, flower pollen, pulverized cat fur, dog hair, house dust, food extracts, dozens of substances. Skin tests failed to reveal any specific allergy. A Washington doctor cut out the adolescent's tonsils, with no effect on the sneezing. Other specialists could find nothing unusual in her lungs or nervous system. Lay cures for sneezing which Mary Cleer was urged to try included wearing a "magnetic" letter pinned to her night dress, looking down the bridge of her nose at pieces of bright silk held close to the tip, clipping an electrified wire to her nose and toes, getting tattooed, taking snuff. Last week when Mary Cleer went to Johns Hopkins Hospital, the great medical faculty there had never before treated or even seen a girl who sneezed so persistently. Johns Hopkins specialists began a new series of tests. A psychiatrist examined the girl and summoned her parents to analyze their mental and emotional makeups. Mary underwent fluoroscopy, blood testing, other examinations. A gynecologist also took her in charge, for the nasal and genital tissues are histologically related. 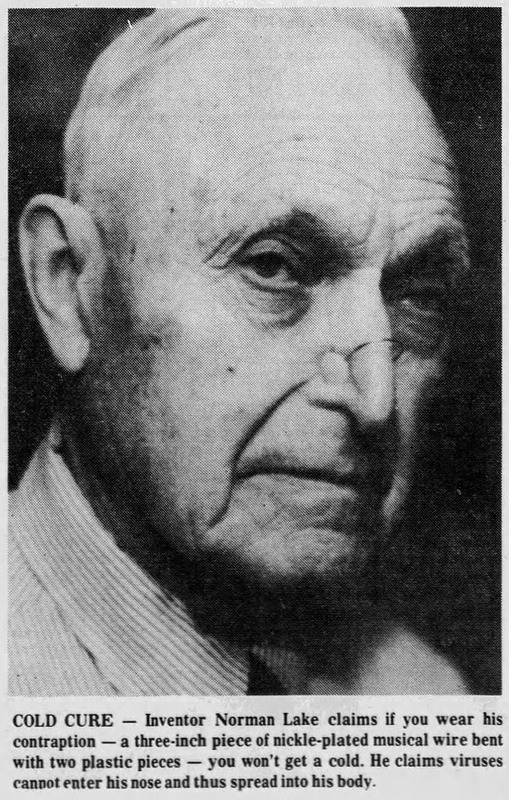 The mucous membranes of the nose swell during sexual excitement. 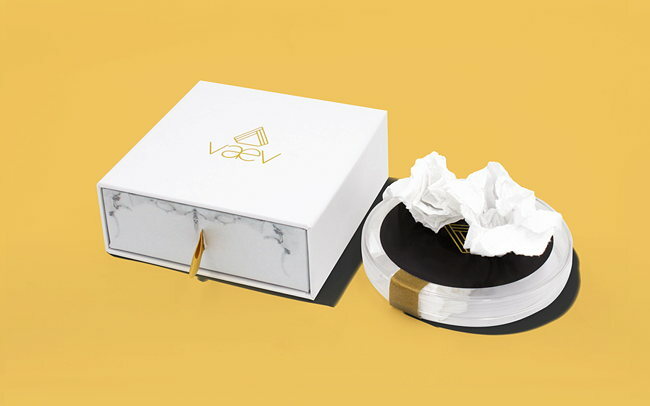 This well-known phenomenon gives rise to a theory that the noses of many little girls become sensitive as they turn into young womanhood, and that this makes such girls sniff, lisp or pamper their noses in an apparently affected manner, and that this overture to womanhood causes an occasional girl to sneeze uncontrollably. 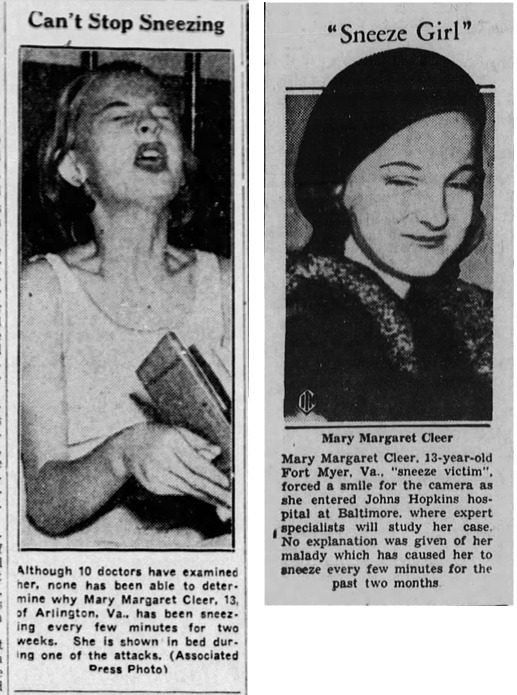 That, a gynecologist might guess, was the trouble with Mary Cleer, 13. Apparently the sneezing eventually stopped of its own accord. No one ever figured out what the cause was.